Imagine you are a woman living in a developing country, perhaps in a rural village with little or no chance of getting a job. You have no assets. No bank will give you credit because you are too poor and you can neither read nor write because you never went to school. How can you feed your family? 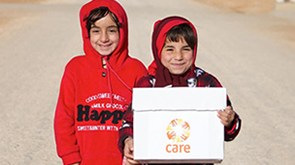 One solution is to become a member of one of CARE’s Village Savings and Loan Associations (VSLAs). We would show you how to get together with other women, and efficiently save and invest small amounts of money. We train you to improve basic business and marketing skills. At the end, you will become a successful entrepreneur. You will earn an income to buy nutritious food for your children. You can send them to school and buy clothes for your sons and daughters. Your husband will start to respect you, because you contribute to your family’s well-being. When women earn, everyone benefits. This was CARE’s guiding vision when we launched our first VSLA in Niger in 1991. We harnessed an ancient African practice of group savings, in which community members pooled together their resources to create a kind of village bank. For the first time, women could save small amounts, see their collective savings grow, and borrow money in times of hardship, such as droughts or illness, or to invest in setting up a small business. CARE’s Village Savings and Loan Associations now thrive across the world – more than 5 million people have become members of VSLAs, and the idea has spread to other international aid organisations and to local organisations, which we train and work with to replicate the model and reach even more people.